The Book of Mormon – The Small Things. Wow. So blogging is a lot more work than I thought. The following post has been a week in the making, not because it is the best post you will ever read, but because every time I sat down to write I got distracted by something else. I’m a busy person, what can I say. The Book of Mormon. Full Cast. Sometimes I think it is incredibly fun and healthy to take time to be a tourist in your own city. I happen to live in a rather large Canadian metropolis so there is a lot to see and do. Personally I am super passionate about theatre and music, and it is nearly impossible to see everything that Toronto has to offer but that doesn’t stop me from trying. 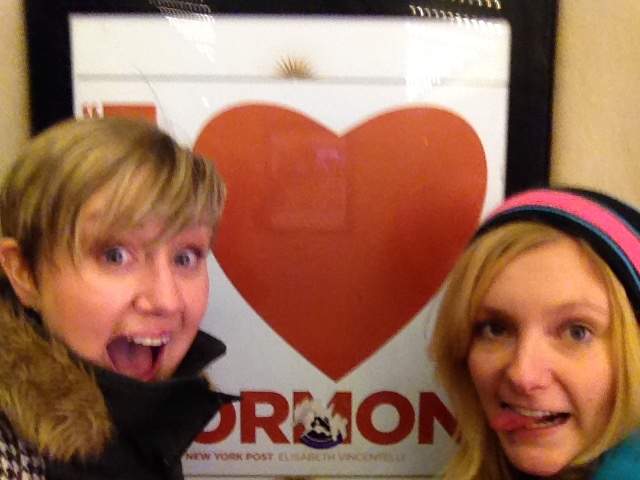 Last Wednesday (November 19th) my friend Lindsay and I had a girls night out, we went to see a musical called The Book of Mormon. But before I get into my review of the show (I have so many opinions) let me tell you about our fantastic dinner! We went to this chic little restaurant called HUSH. I apologize for the poor quality of all the photos in this post. The restaurant had major mood lighting going on, great for atmosphere but not so great for photos. Wine. 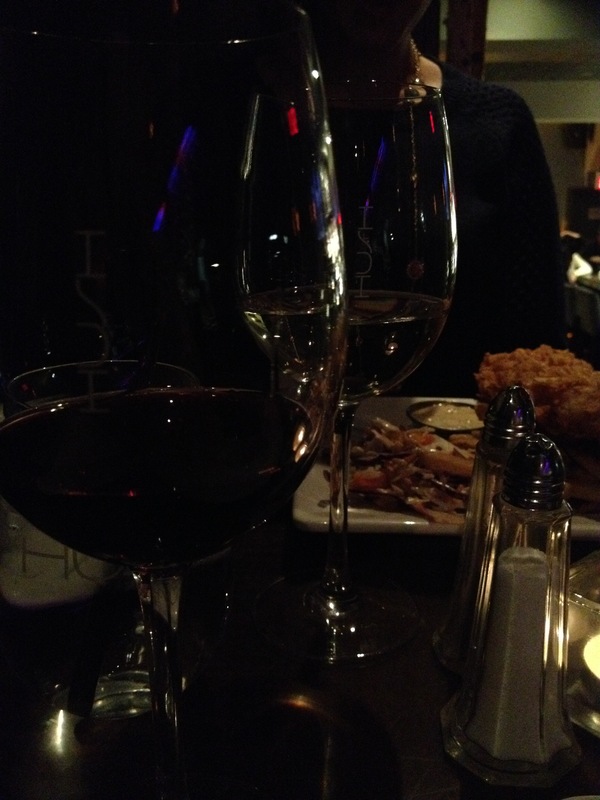 Lindsay had a White Moscato and I had a Red Malbec. For dinner. 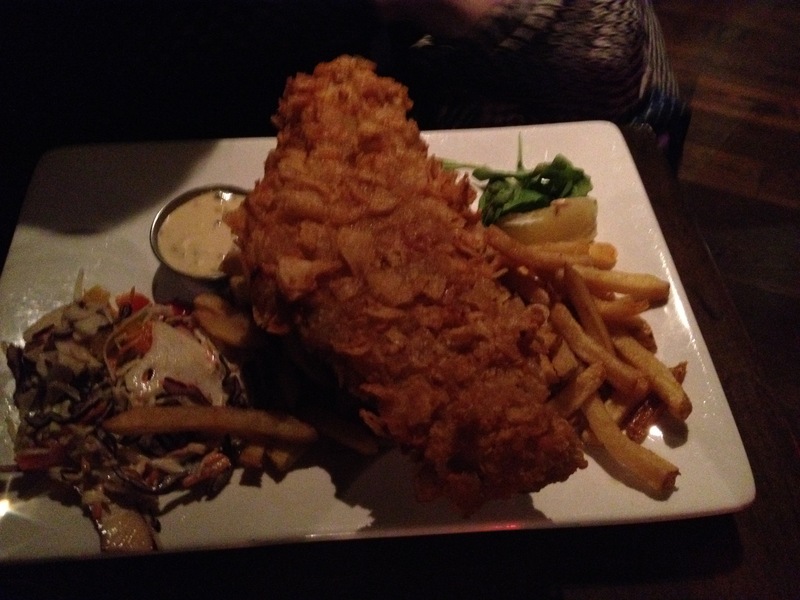 Lindsay had fish & chips. The fish was massive! We probably could have shared her meal and still had leftovers. But we did not share, we greedily each got our own plate of deliciousness. I had Lobster grilled cheese. Yes you heard me correctly. Lobster Grilled Cheese. It was luxurious and incredibly unhealthy. I loved every second of it. I promise I don’t always eat badly, but when I do… I go all out. 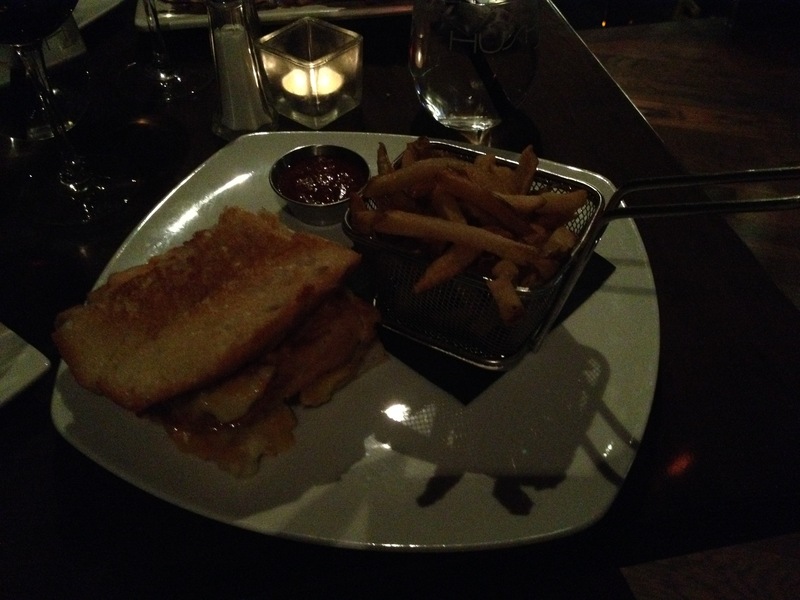 My Lobster Grilled Cheese & Fries. 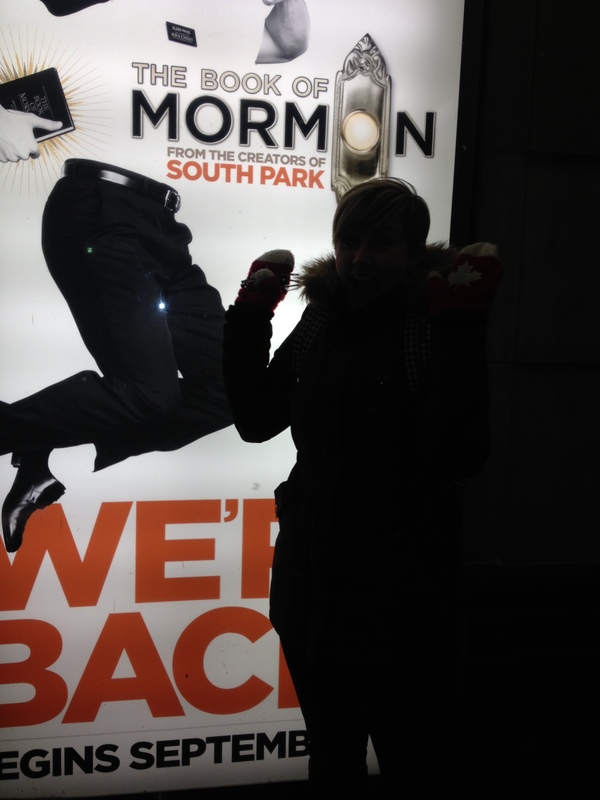 For those of you who don’t know, The Book of Mormon is a hit Broadway musical created by the same guys who created South Park. 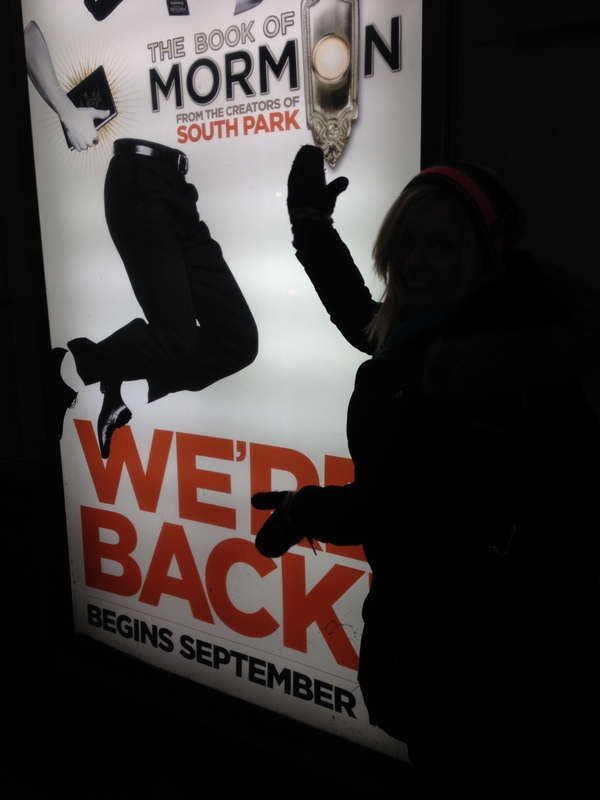 That should give you a sense of the kind of humour in this show. Vulgar, yet hilarious. Let me summarize the plot for you real quick: Two young mormon boys men travel to Africa to spread the word of God and bring people into the Mormon faith. Hilarity ensues. Basically it is a lot of making fun of religion, playing up stereotypes and swearing. So. Much. Swearing. I knew this going into it so I wasn’t shocked or offended but I think the woman sitting next to me was. She left at intermission and never came back. While I thought it was a funny show, I can totally see why someone would be offended by it. I think in order to appreciate this show you have to be aware that the humor is vulgar and base. They are using all means to get a laugh and if you are okay with that it can be a really fun show. I also think its important to recognize that this show isn’t just making fun of the Book of Mormon, it is also making fun of musicals and the musical theatre art form. So it had a lot of cheesy moments and standard characters and the music wasn’t anything special. But again, it is all a part of the humor and because I knew that going in I was prepared. Other hit Broadway musicals like Wicked or Billy Elliot, for example, exist to showcase music and dance respectively, so they shine in those areas. 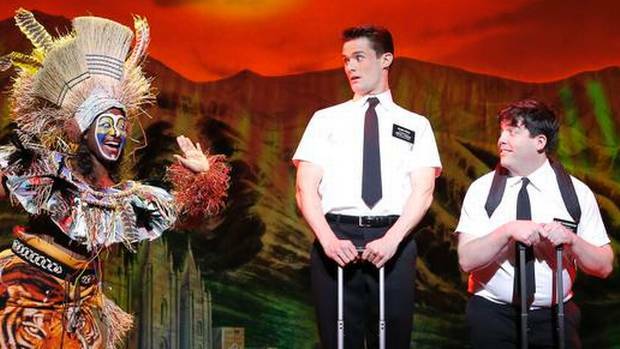 The Book of Mormon exists to be funny and as long as you aren’t easily offended that is, I think, where it shines. Small thing take away: I really enjoyed the production and I had a really fun night being a Toronto tourist with Lindsay. 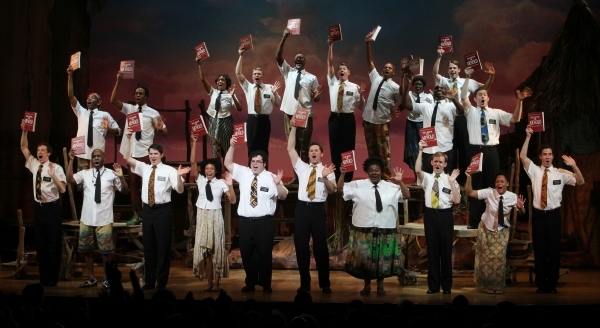 If you are near Toronto and want a good laugh The Book of Mormon is playing at the Princess of Whales Theatre until November 30th. Have you seen the Book of Mormon? What were your thoughts? ← The Downward Dog Conundrum.